Everyone wants loyal, raving customers. But how to you build loyalty-and create brand influence - when traditional advertising and marketing strategies don't work? How can you create real engagement - where your URL matches up with IRL (that's "in real life")? Here's the book that shows you how to build and influence a new kind of conversation - taking your message beyond the likes, tweets and pokes, with a strategic guidebook to branding in the digital age. Learn how to match your message to your market, create new types of engagement, and inspire every division within your organization. Branding isn't just a part of your business - it is your business. Written by Chris Westfall (author of The NEW Elevator Pitch), this book turns traditional marketing ideas into actionable results for your brand. Whether you are a solopreneur, or a brand manager for a multi-national company, you owe it to yourself to understand what organizations like Cargill, Cisco and the Huffington Post know about building a world-class brand. Today, customers have more ammunition than ever. That's why you've got to have bulletproof branding. There's never a good time to make a bad presentation. Take control of your personal message and discover how to make a real connection, with a book that shatters the myth of the old-school elevator pitch. The NEW Elevator Pitch is more than just a short two-minute speech; it's a method of communication for the digital age. Whether you tweet it or tell it, your story has to be strong, or it's lost in the noise. Here's the hold-your-handbook for creating a compelling and authentic connection to the people that matter most. In a web-2.0 world, it's no secret that the elevator platform has been replaced with the social platform. Today, engaging and connecting isn't based on some outdated sales strategy or verbal gymnastics - it's based on the story of YOU. Find out how to uncover the important stuff, overcome your nerves, and share your personal message in a way that's concise and powerful. Make a difference in your career, your community and your relationships with the power of The NEW Elevator Pitch. How's your elevator pitch? Chris Westfall has created multi-million dollar revenue streams for companies on four continents, with innovative new strategies on leadership communication. As the US National Elevator Pitch Champion, he's coached clients onto Shark Tank, Shark Tank Australia and Dragon's Den, helped entrepreneurs to raise millions from investors, and successfully re-branded products and services around the globe. His keynote presentations help organizations to understand the new rules of engagement: an authentic persuasion that's not pushy, "sales-y" or fake. He's the producer and co-host of The 118 Pitch Course with Bloomberg TV's Jeffrey Hayzlett, and an award-winning instructor at a top 10 MBA program. A coach to authors, television correspondents and executives, his strategies have helped raise over $30 million for student start-ups, launching over 50 businesses and creating hundreds of jobs. Originally from Chicago, Chris resides in Houston, TX with his wife and two daughters, and is an avid supporter of the performing and visual arts. How's your elevator pitch? When someone asks you, "So, why should I do business with you?" how do you respond? Learn how to engage, persuade and connect in new and more powerful ways - without "pitching" anything! 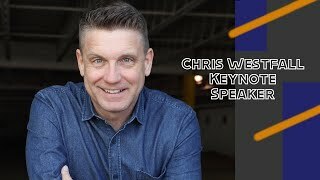 Chris Westfall is the US National Elevator Pitch Champion, and his keynote can help you and your organization to be more influential - and more compelling - than ever before! Collaborate, connect and close the deal - with advice from the Champ! A cross-generational National Elevator Pitch Champion. Working with the leaders of tomorrow at colleges and universities across North America, Chris Westfall provides proven principles (as well as case studies and scientific resources) on how to connect with the largest workplace demographic. Sell to Millennials more effectively, communicate more clearly, manage more precisely and retain more profitably - via fresh strategies that target Gen Y. From practical experience to practical application, this keynote will energize all generations! Gen Y represents the future, in business—but how are we building that future, and shaping the leaders of tomorrow? We all know the statistics on Millennials—isn't it time to go beyond data, and find new ways of connecting with this key group? By building bridges across the generations, this powerful and interactive keynote sheds new light on the subject of cross-generational management strategies. As the publisher of The Millennial CEO, Chris Westfall's strategies have helped raise over $10 million in investment for millennial-owned businesses, creating over 50 companies and hundreds of jobs, while transforming multiple careers in the process. Leadership Language is the highly-anticipated follow up for best-selling author, consultant and keynote speaker, Chris Westfall. Discover how to cut across generational differences, with communication strategies that can change your results. The transformation that you seek—in your career, your relationships and your personal impact—is exactly one conversation away. Are you ready to begin? Branding isn't a part of your business - it IS your business. Designed for leaders seeking new guidance on how to connect and engage with the people that matter most: your customers. Take a fresh look at the strategies behind your brand - and learn how to make the connections that really matter. Going beyond social media, this keynote addresses the strategy behind your unique message. Whether you tweet it or tell it, your story has to be strong - learn how market leaders are creating greater connection, and influencing the conversation, in this highly-informative keynote.